Honestly, I’m not the biggest fan of drink coasters. Well, it’s not so much the actual coasters that bother me, it’s the “coaster people”. One drink on a table in their home without a coaster and it’s chaoshavocpanic. If you’re one of these people or you have a friend like that, check out today’s post which I rounded up 15 creative and unusual coaster designs. Get one, then you can enjoy the coaster and no one will freak out. At first sight, it might look like someone has spilled their drink and it’s time for you to worry about your wooden surface. Fact is, that’s just a clumsy coaster. 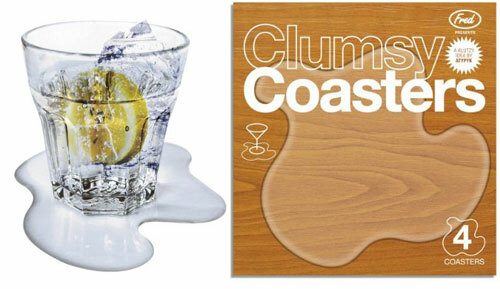 Fred’s Clumsy Coasters are little faux spills, meant as a joke to freak out the neat-freak in your life. 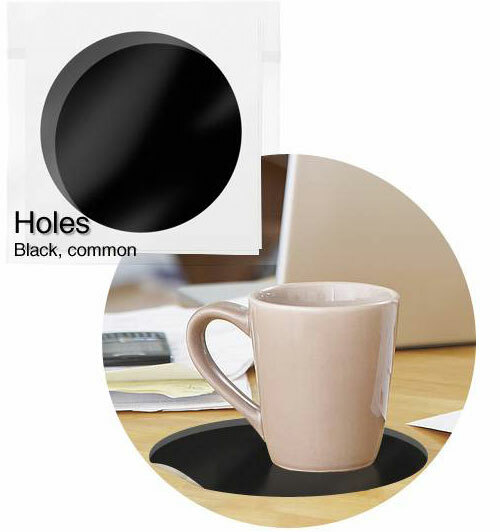 It would also make a great gift for the clumsy person who keeps spilling their drinks, this way it’s already spilled! A drop of water can turn into a flood on this micro-city coaster. Here, the city of Taipei, Taiwan is resized into a cup pad. Condensation from the cup can slowly flood the city especially during hot summer seasons. The water will first fill up the river and slowly work its way into the narrower streets and alleys. Enjoy the view from above as it also reminds us of the importance of water resource. 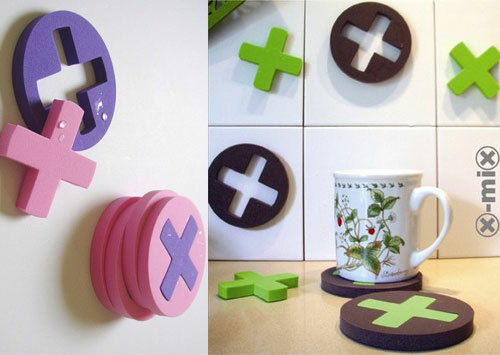 These Tic Tac Toe coasters make coffee breaks twice as fun! The rubber coasters double as a game of Tic Tac Toe by removing the crosses from the coasters, creating ten playing pieces. 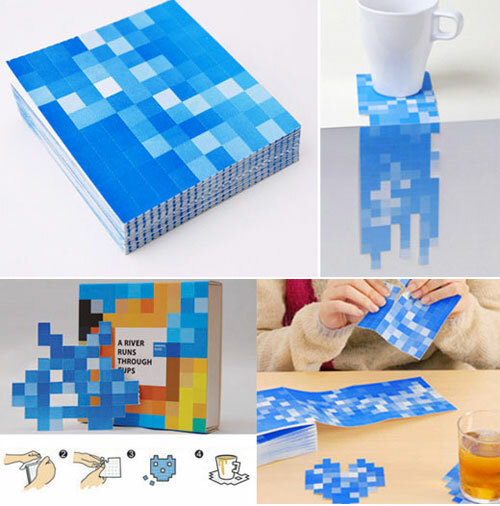 By wetting the coasters You can stick them to any smooth surface, like tiles or mirrors. So y ou can pretty much play with them anywhere around the house. 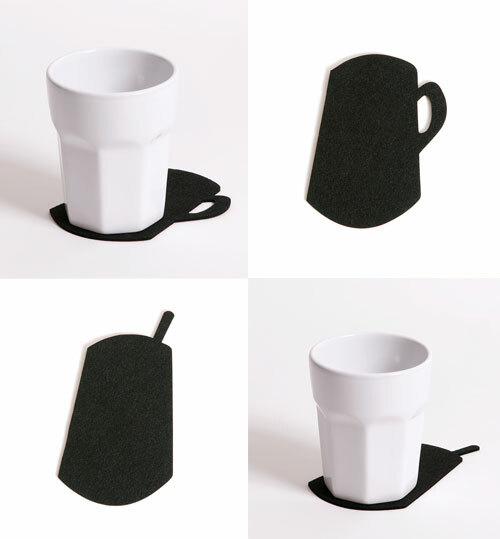 Experience the strange feeling that the shadow of your cup is not what it’s supposed to be! Available in 2 shadows, Coffee Mug and Soda Can. Phwoar! That head is just the right size for resting your mug on! 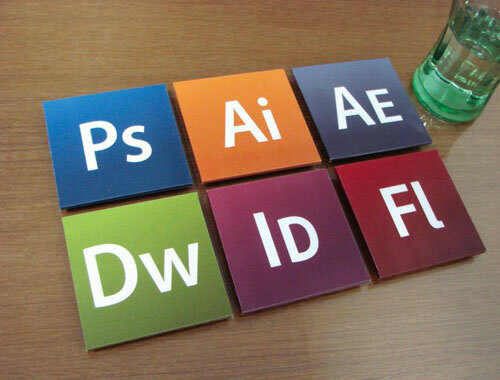 These funky coloured coasters can be stood up as interesting figures when not in use. Not only does this make visitors curious, but when you show them their real use, step back, because people will get excited. iPhone (iPad) fans out there… I know you’ll be drooling over these! 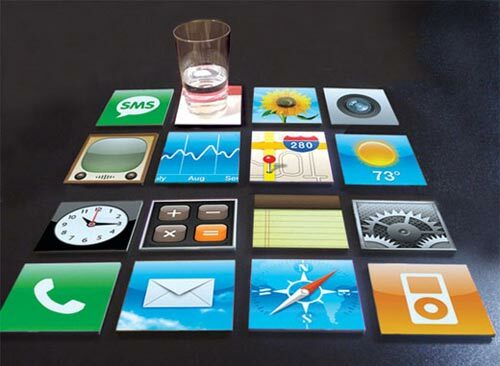 The iPhone Coaster Set includes 16 coasters of different iPhone (iPad) menu icons. Have you guessed right? 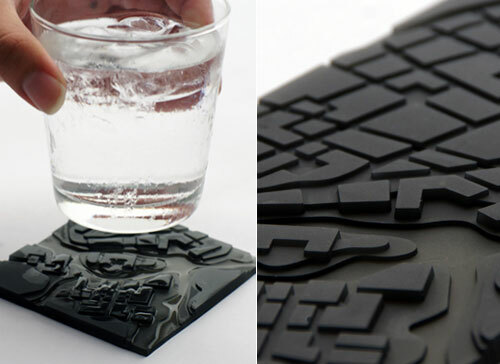 The black hole is actually a creative coaster that results in a perfect 3D effect. A victim of a tragic drinking incident. Stan was happy and completely oblivious to the dangerous conditions. There were heavy drinks being hoisted and lowered all around him, yet he always felt perfectly safe. Then Stan got splatted by a giant pint. Now the only thing he can do is protect your table top from tea and coffee stains. 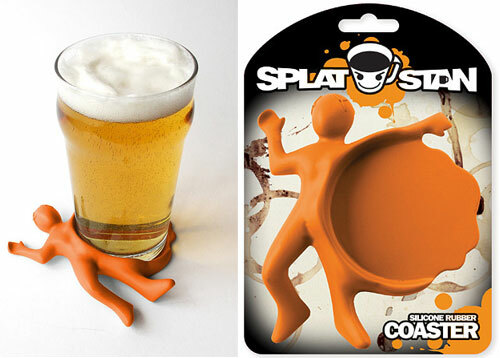 He was never the smartest fellow but now he’s a clever coaster for your mugs and glasses. American Burger Coaster Set – each piece of the burger is a separate individual coaster. Buns, burger, tomato and of course, lettuce. It’s definitely cool as far as coasters go. Stylish and perfect for summer, these vibrantly colored Seashell flip flop coasters make the perfect complement to your bottle of wine. Just slip one of these flip flop coasters onto your wine glass / pilsner / martini and it will travel with you as you mingle and socialize. Not to mention you’ll easily be able to identify which glass is yours! 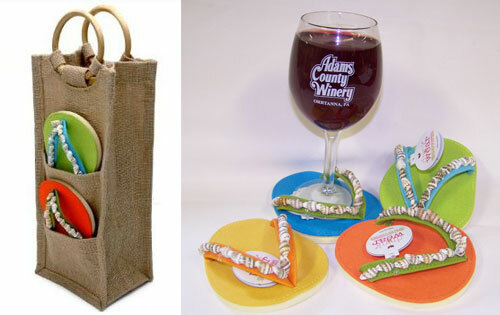 This deluxe set includes 4 coasters and a Jute wine bag which holds the four coasters a bottle of wine for easy carrying. A great gift idea for picnics, pool parties, or birthdays! 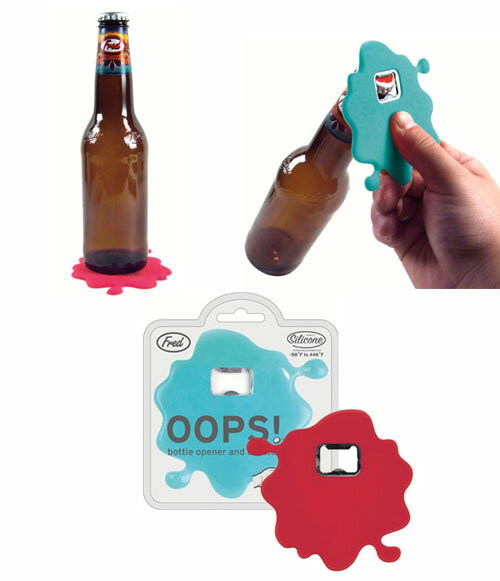 Accidents can happen…but the worst kind of accident is being caught without a bottle opener when you need one! So keep our OOPS! Bottle Opener & Coaster handy on your counter. It doubles as a coaster too! Two assorted colors, peggable clear clamshell packing. What appears to be a coaster with printing gone wrong… Am I drunk already? 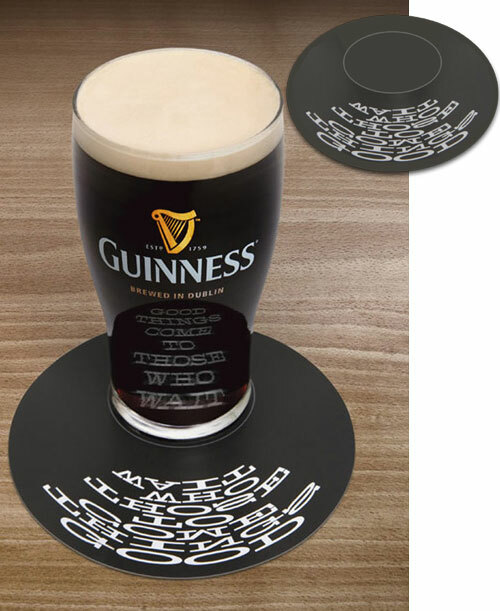 Is actually an optical illusion/secret messages that uses a Guinness glass as a decoder. Awesome. It’s a creative designs.